Bursledon regatta got off to a good start with a big turn out for the dinghy racing on Saturday morning. 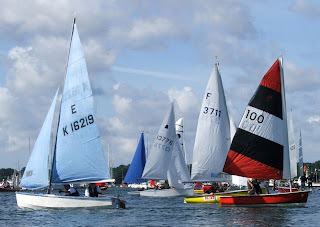 A lot of the entrants had come up river from both Hamble Sailing Club and Warsash Sailing club. The race runs from the start at Lands End Hard, down river to Warsash and then back up to finish off the Jolly Sailor in Bursledon pool. It's a great race for kids, here on the final stretch I'm being overhauled by this 9 year old and her dad in a mirror dinghy. 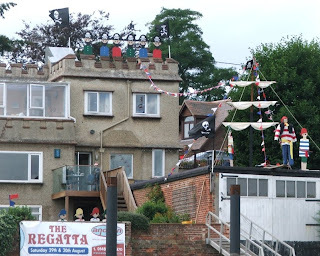 The theme for this year's regatta was Pirates of the Caribbean, and up at the Elephant Boatyard, the preparations included an island backdrop and pirate tavern. A goodly contingent of local pirates also turned out to watch the afternoon fun! The Solent Old Gaffers Association were celebrating their 50th anniversary of the first race which also ran from the Elephant boatyard, these lovely old craft, several around 100 years old made a spectacular sight, along with other classic local boats. A pirate event, wouldn't be complete without a pirate ship and of course there were several, this fine example is a replica of a 17th century ship of the line, with fully detailed and complete working sail. 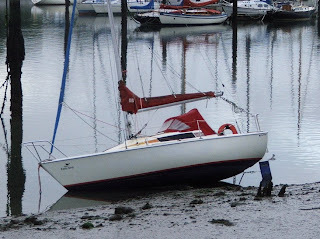 Here she gets a tow to a safe anchorage by Bursledon's famous desert island. 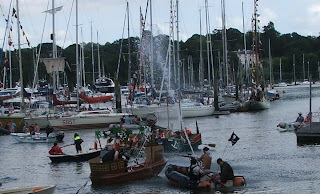 Once all the sensible sailing and rowing races were out of the way, the local pirate fleet took centre stage with a mock battle, the rib mounted water cannon definitely out gunned the normal water pistols and plastic cutlasses! 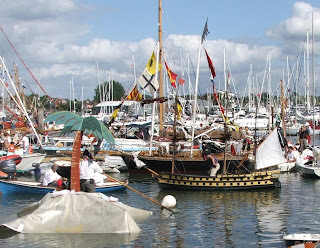 With “Pirates of the Caribbean” as the theme for the upcoming Bursledon Regatta (Aug 29th) and the strange circumstances surroundings the recent disappearance of the freighter Artic Star, Pirates have been on my mind of late. Before Johnny Depp and Jack Sparrow hit the screens, for most of us, that most famous creation of Robert Louis Stevenson; Long John Silver represented the archetypal seafaring buccaneer, with his parrot, gold earring and his relentless search for Flint’s treasure. I remember as a very small child, being frightened by Robert Newton’s portrayal of Silver the 1950 Disney production of Treasure Island. 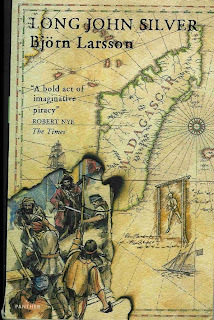 If you’ve seen the film or read the book, “Treasure Island” is a great story, but for a sequel, track down Bjorn Larsson’s book “Long John Silver”. The Swedish author has captured the character of Long John Silver and produced a book which chronicles his life and character both before and after Treasure Island, his journey through the often savage times and circumstances, which led him into to piracy. The most remarkable and wholly believable aspect of Larsson’s characterisation is the intelligence, wit and overarching thirst for survival which Silver possesses and which allows him to rise apart from the bloodthirsty rabble, who were his fellow pirates. Pirate fans should track down a copy. 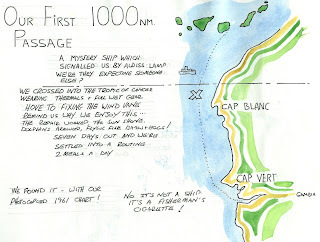 Peter Benchly (of Jaw’s fame) wrote an interesting tale about pirates surviving in isolation from the modern world, into the 20th century, where they maintained their “pirate code” and continued to prey on shipping from an isolated Caribbean Island. 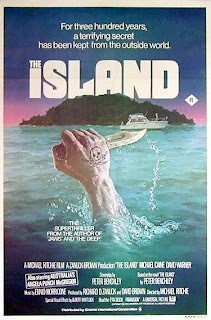 An early 80’s film production starred Michael Cane, but I’d recommend the book, although the idea of a “lost community of pirates” operating in the Bermuda Triangle is even less credible now that we have Google Earth! Our own pirate story happened over 10 years ago, Erica and I were out of Las Palmas sailing for the Gambia in West Africa. Heading south about 30 to 40 miles off the African coast at night, when we sighted a small coaster. Its navigation lights were on, but didn’t appear to be underway. Suddenly it started signalling us with an aldis lamp. I didn’t read morse code in those days, but I knew enough to see that they weren’t putting out an SOS. We tried calling them on the VHF with no result, the light continued to flash out the mysterious message. Then the penny dropped, if I were on a ship and meeting someone in secret, an aldis lamp is perfect for such clandestine signals. Since we clearly weren’t the people they might be expecting, we shut off all our lights, and in the darkness put the boat onto a fast reach, heading out into the Atlantic as fast as we could sail, hoping that they didn’t have radar and didn’t follow us. After an anxious hour it was clear they weren’t following and after another equally anxious hour their lights had gone out of sight below the horizon. Pirates, who knows? It could have been perfectly innocent, just fishermen hauling nets, but it was scary at the time. Scary enough for us to sail with lights out at night, and to make sure we stayed at least 100 miles off the African coast; until we made our approach to Banjul in Gambia. Low water this morning was at 6.30AM, a little too early to go out and see if the cricket was being played on the Bramble Bank, however I did go for an early run along the river, or rather what was left of it. Our Solent mud, might not have the quality or quantity of that up in the Essex and Suffolk rivers, but I'm sure our east coast readers will find the scene familiar. Hopefully they didn't sleep on board last night! 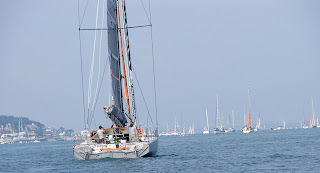 We saw Morwenna alongside in Cowes on last Saturday, but it wasn't until she appeared with her bright orange storm sails set, along with the rest of the Fastnet fleet on Sunday morning, that we realised she was entering the race. 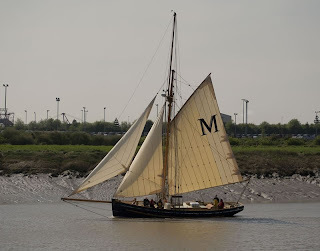 Morwena is a brand new Bristol Channel Pilot cutter, designed by Ed Burnett and built at the Underfall Yard in Bristol. At 45 feet on deck and 60 feet to the end of the bowsprit, Morwenna displaces 28 tons. Constructed of English oak, she is a direct descendant of the Bristol Channel Pilot cutters with their legendary sea keeping qualities. There's also a direct link back to Jolie Brise, which although a French Le Harve pilot cutter, was the winner of the very first Fastnet race in 1925. 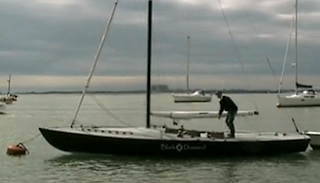 In the 80 add years since Jolie Brise set the standard for offshore racing, things have moved on somewhat. 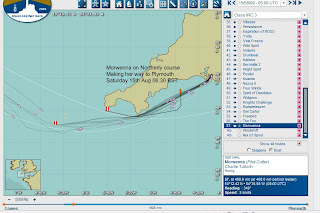 While the 100 foot Leopard took line honours, arriving in Plymouth in 2 days 11 hours, Morwenna was following the rest of the fleet, still still heading out towards the western approaches. Morwenna was a 5th century Cornish saint who made her home in the cliffs near Bude on the wild north Cornish coast. The derivation of her name is believed to be maiden or white seas, which seems to be an entirely appropriate name. Cowes Week finished on Friday, but the town was still buzzing at the weekend with crews and spectators and of course more than a few boats getting ready for the start of the Fastnet race on Sunday. 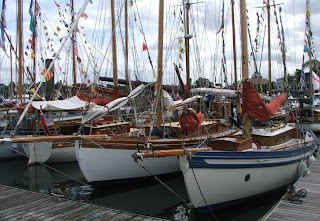 One of the things I really like about the Cowes regatta is the small and traditional keel boat classes. Here a couple of Solent Sunbeams heading east with the tide on Sunday morning. 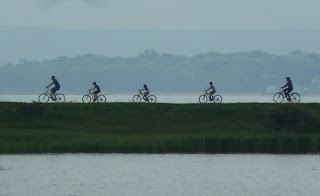 My guess is they're heading back to Itchenor in Chichester Harbour. Designed by Alfred Westmacott as a fast 3 ton, half decked keel boat, with 300 sq ft of sail area. 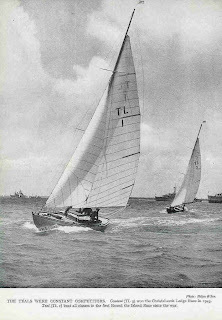 The Itchenor fleet started in 1922 and the Falmouth fleet in 1924, the main difference being that the Solent fleet could fly spinnakers, while the Falmouth boats were restricted to a poled out genoa. 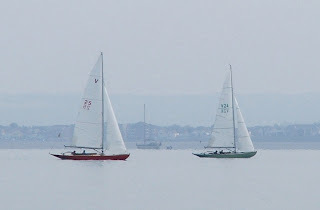 Although since 1965 they have all sailed under the amalgamated "Sunbeam Class" and meet together for some very competitive racing. 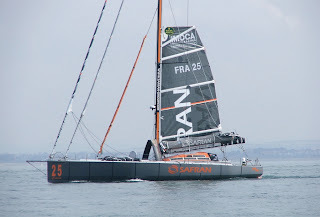 The famous Fastnet Race started today at 12.00, off Cowes on the Isle of Wight. 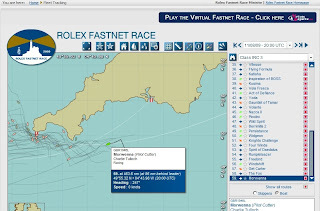 The race, a 600 mile offshore bash, starts in the sheltered Solent, then goes down the English Channel, out into the Western Approaches around the Fastnet Rock off the Southern Irish coast, before returning to the finish at Plymouth in Devon. 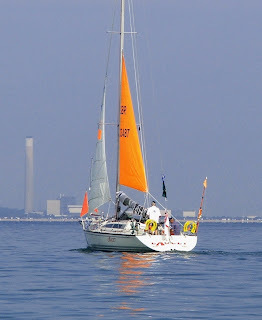 We were anchored in Osbourne Bay, just along from Cowes and saw the fist of the fleet starting to assemble in Cowes Roads. The competitors all seemed to have their orange storm sails set and were easy to identify, perhaps this is a last minute entry requirement I don't know, but it made for a colourful scene. 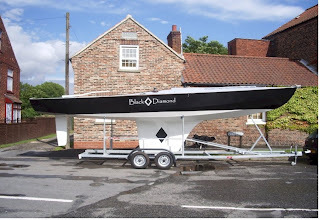 While many of the entries were local race boats, there were more than a few extreme yachts, like this beast! 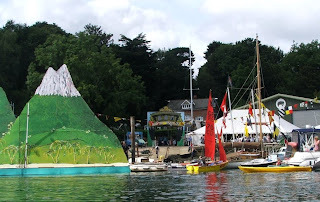 Our local Bursledon Regatta takes place at the end of August (29th/30th). 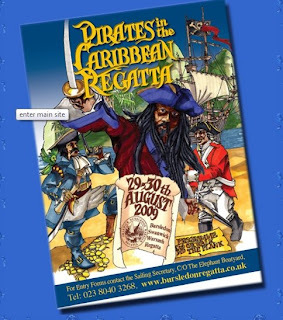 The regatta which celebrates it’s 139th year , starts on Saturday 29th in the Elephant Boatyard and has the theme “Pirates of the Caribbean” which should provide a colourful backdrop to the event. 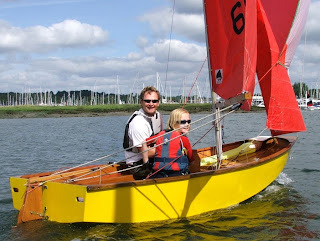 On Saturday (29th) morning dinghy races run from Lands End Hard down river, past Hamble and Warsash villages and out around the cardinal buoy in Southampton water, before turning back to the finish at Bursledon. 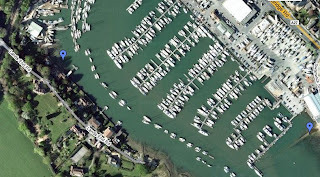 In the afternoon the rowing races will take place in Bursledon pool between the Elephant yard and the Jolly Sailor pub. I’ll be racing Gato Nego against the Hamble gigs, as I did in the Hamble River Raid in back in May, so please come and cheer me on. 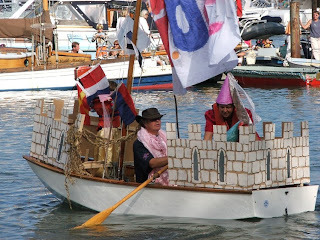 If previous years are anything to go by, the dinghy parade promises to be interesting, expect at least a couple of pirate ships to turn up for the parade. 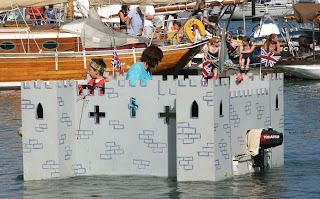 Photo’s below are from last year’s regatta when the theme was “Camelot”. 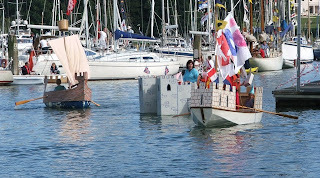 The winning entry was a castle complete with damsel in distress and working drawbridge – not bad for a 12 foot dinghy!! The evening event kicks off with a torch lit dinghy parade, hog roast and music, followed by fireworks. 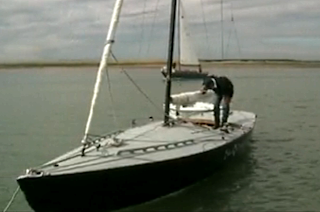 Sunday (30th) has the bigger yachts racing out in the Solent, as an additional attraction the Solent Old Gaffers will be attending the regatta to mark the 50th anniversary of their first race which was run from the Elephant Boat Yard. I’d also like to extend a thank you to the regatta committee and the many sponsors who make this annual event such a success. I recently found an old copy of “More Sailing Days” by Adlard Coles in a charity shop. Published in 1947, it tells of Coles sailing adventures on the south coast of England immediately following the end of World War Two. 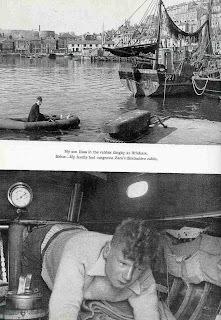 Leisure sailing in the Solent had been stopped by the military during the war years, but Coles was fortunate to have been granted an early permit to sail during 1945 in order to update his pilot guide and sailing directions “Creeks and Harbours of the Solent”. 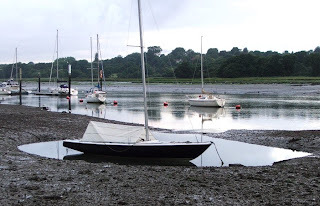 His first trip was to bring his pre-war yacht Zara, a diminutive 19 foot Tualare class sloop, from Itchenor, where it had passed the war years safely, back to her home mooring in Bursledon. Coles entered Zara in Bursledon regatta in 1945, the first to be held since the outbreak of war. He tells of sailing the vivid red, and newly painted Zara; down the Hamble river, past sailors and marines watching from the drab, grey naval launches and landing craft which used the river as a wartime base. Navigation at night was forbidden as a safety precaution since there were no lit navigation marks and the additional hazard of unmarked ship wrecks all along the south coast. Coles gives a good description of finding his way into the unmarked Newton Creek using the transit of a tower which was visible up on the Wight downs. Despite our best efforts we couldn’t find it on our recent visit to Newton, presumably it hasn’t survived the intervening 60 odd years since the war. Further west there’s a charming account of Coles anchored in fog outside on Babbacombe in Devon. A fisherman appeared out of the fog rowing a small boat and after some banter and negotiation towed Zara into the harbour and safety. 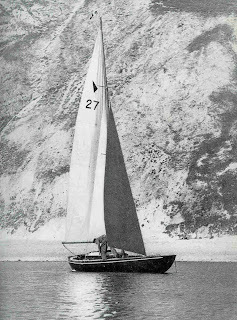 At 19 feet, Zara eventually proved too small for the growing Coles family and she was sold initially replaced with the Fred Parker design Mary Aidan. She in turn was quickly superseded by the famous Cohoe, in which Coles cruised and raced extensively during the post war years. 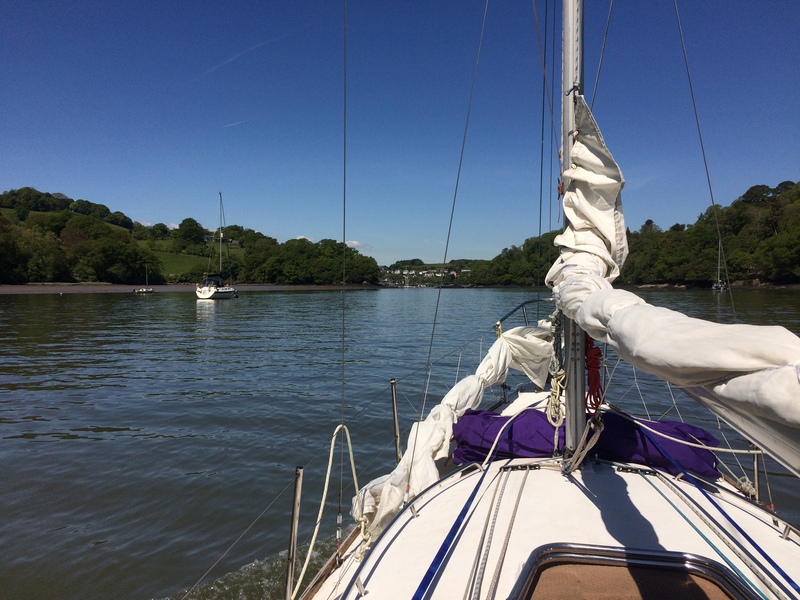 For those of us who sail the Solent and the South Coast of England, More Sailing Days gives us a view of our favourite cruising grounds, a view which is familiar yet distant; un-crowded and less hurried. When fisherman still earned their living, working out of the small harbours and us yachtsmen were in the minority.